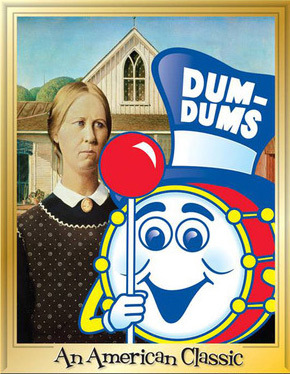 I had a Dum-Dum Pop sitting in my desk. The wrapper mentioned saving 20 wrappers to get a reduced price on “Stuff”. You think the Art Institute of Chicago is aware of this piece of Dum-Dum “stuff”? Probably not. LOL. I’m printed this out, and I’m gonna see if i can leave the printout by the original painting in the art institute tomorrow. The Art Institute’s flickr account is tagged as appearing in the photo. Consider the Art Institute notified!